Pacquiao was rushed to the clinic of veterinarian Dr. Gibb Devora who checked the condition of the dog. The bullet had entered Pacquiao’s left cheek and went through his right cheek, affecting both his jaw and tongue. According to Dr. Devora, the infection from the dog’s massive wound has set in. He’s not sure either if Pacquiao’s jaw would be restored. The dog’s owner, Teofilo Layaog, is asking for help. 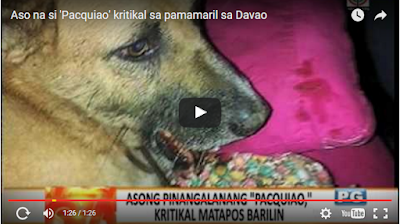 He also hopes that the person responsible for his dog’s suffering will be caught and punished.